The Weatherly Building is 12-story tower at SE Grand and Morrison, built between 1927 and 1928. The building secondary contributing property in the East Portland Grand Avenue Historic District, and the only high-rise structure in the district. 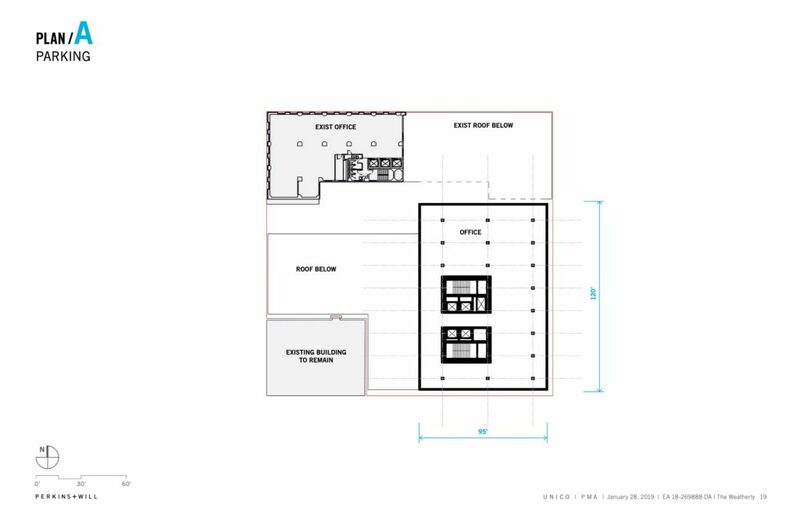 The Weatherly’s owners are also proposing a seismic retrofit of the building, which would be reviewed separately to the new construction. The proposed new building would occupy the parking lot to the south of the Weatherly, part of which was occupied by the Oriental Theatre until its demolition in 1970. 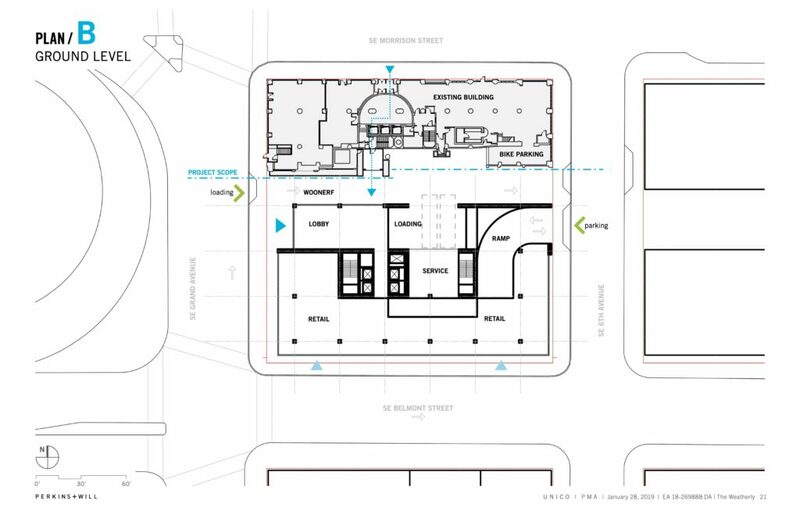 In Scheme A, shown in the drawings below, the existing two story building at the corner of SE Grand and Belmont would remain. 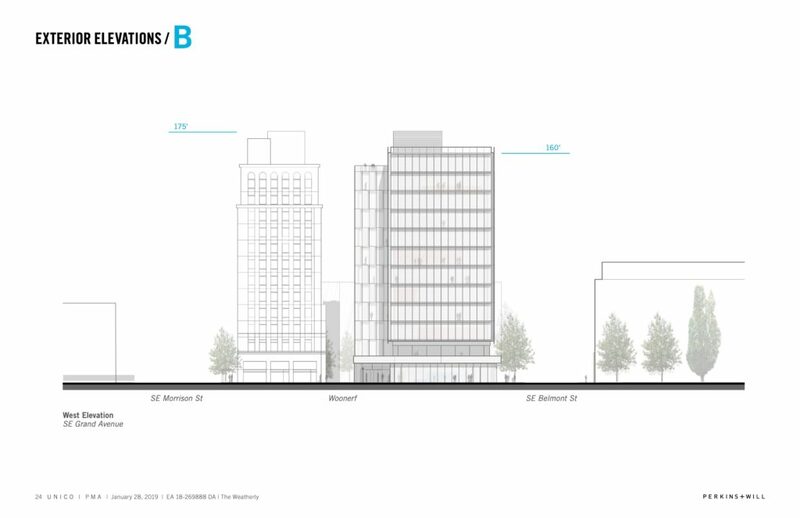 In Scheme B, shown in the drawings and renderings, the two story building would be demolished. Scheme B would move ahead if the developer is able to acquire the existing building, currently home to Pour Sports Bar & Grill. In Scheme A the new building would include 143,865 sq ft of office and retail space, and three levels of below grade parking, with 78 vehicular parking spaces. 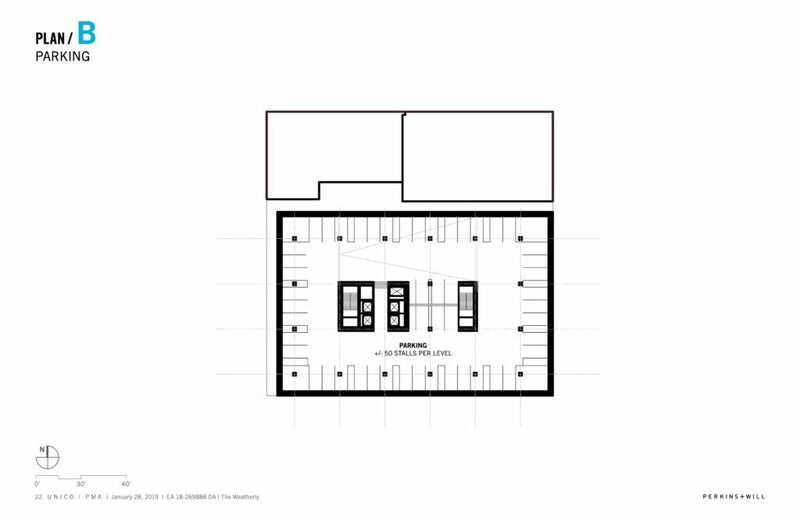 In Scheme B the new building would include 201,900 sq ft of office and retail space, and three levels of below grade parking, with 150 vehicular parking spaces. 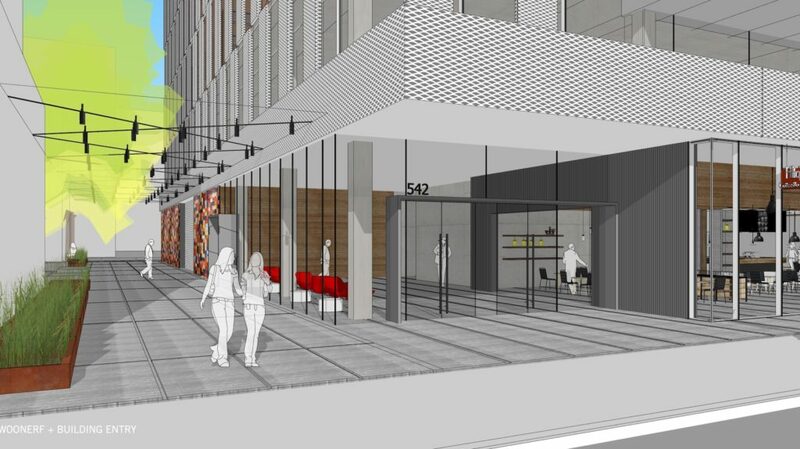 Both schemes would have ground floor retail space fronting onto SE Grand, Belmont and 6th. 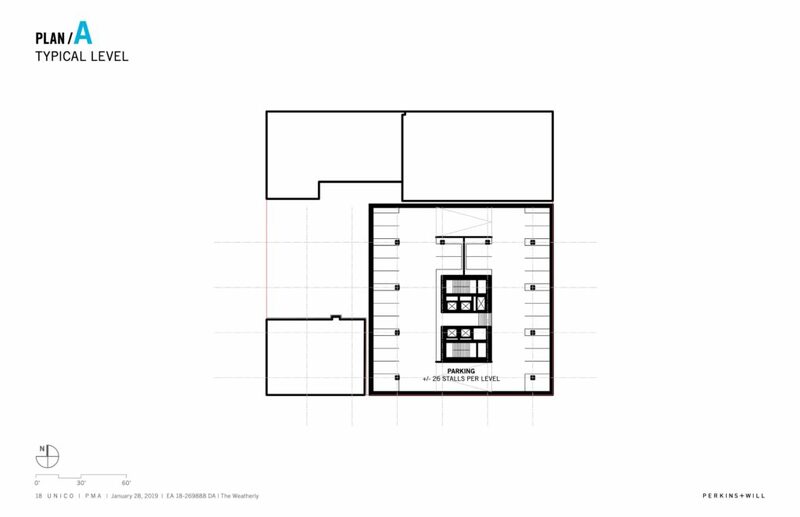 In Scheme A the office lobby would be placed on SE Belmont; in Scheme B it would be placed on SE Grand. 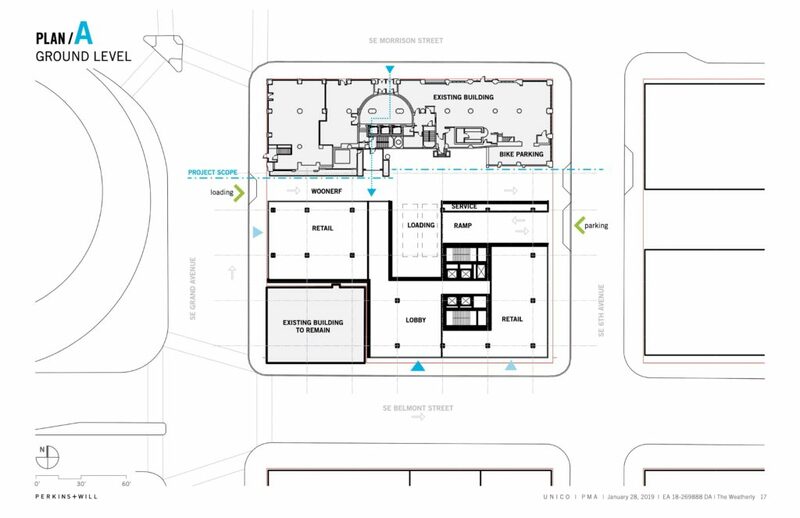 The new construction would mid separated from the Weatherly by a mid-block “woonerf“, which would provide loading access for the two buildings. Parking for the new construction would be accessed from SE 6th Ave. 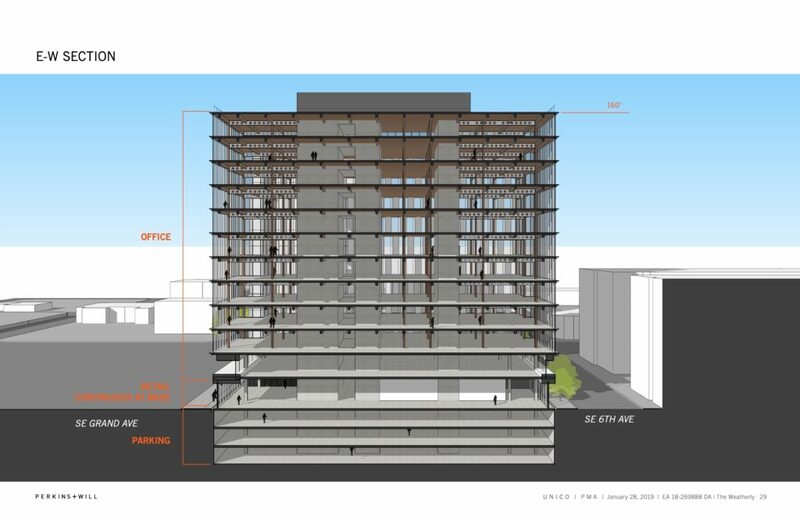 The new building would be framed with cross-laminated timber (CLT) and have a highly glazed facade. 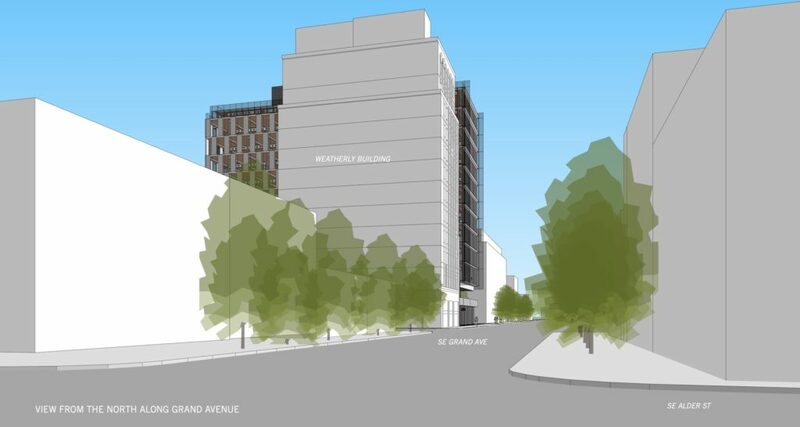 The project at the Weatherly site went in front of the Historic Landmarks Commission for Design Advice on February 11th, 2019. 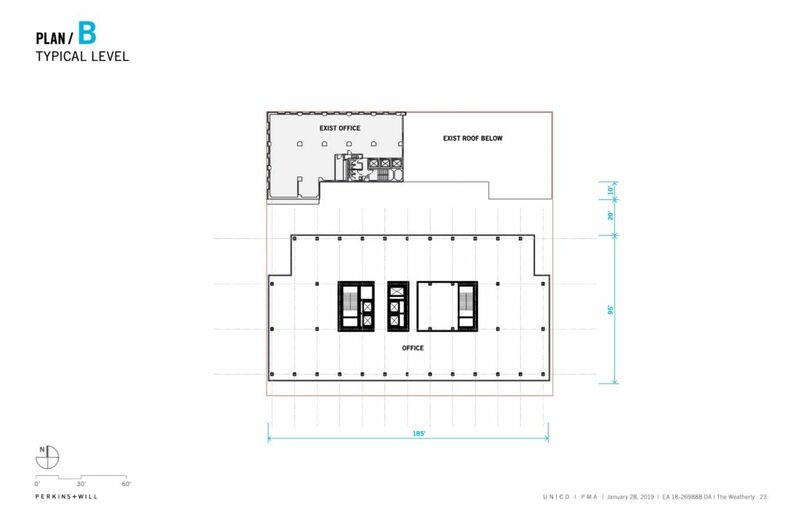 “Macro level” issues identified in a staff memo, published before the meeting, included: the building’s siting and orientation; the height, scale, form and proportion of the new structure; the architectural character of the proposal, including the glass facade; and the parking and loading location and access. If it’s this tall, it can’t be this tall all the way out to Grand, because I think that really does kind of obliterate the presence of the Weatherly Building that you get from anywhere within the district. In order to gain approval the project will be required to go through a Type III Historic Resource Review, with public hearings in front of the Design Commission. This entry was posted in 510 SE Morrison, Buckman, Perkins + Will, Unico. Bookmark the permalink. On it’s own… whatever. It isn’t horrible and it isn’t amazing, but next to that building it just looks so wrong. Good! This building is ugly and out of place anyway, obliterate it literally or figuratively, please. 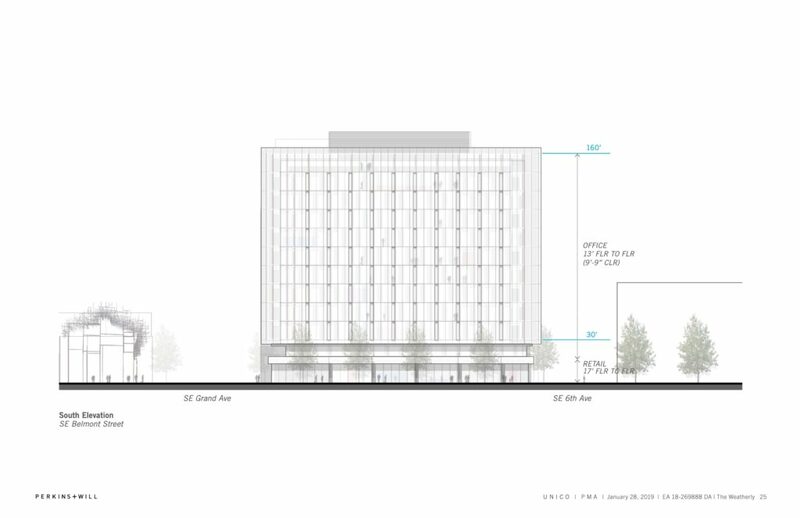 The Weatherly will be “out of place” until the city allows more tall buildings around it. The Weatherly’s builder hoped that it would inspire more tall buildings in the neighborhood, but the Depression occurred just as it was built and no buildings followed. Now that the economy allows tall buildings to be built, I guess Landmarks wants to modify them so the Weatherly will still stand out (or be “out of place”). Agreed, Doug. 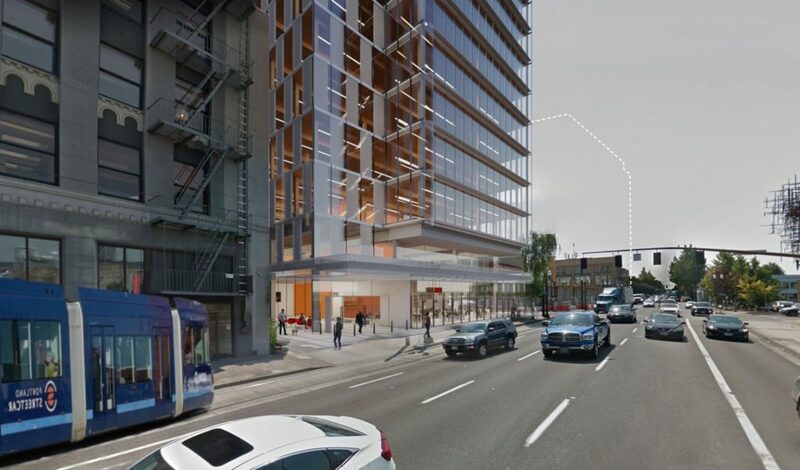 I’m not infatuated with tallness and think that, on the whole, Portland is best served by 3-to-6- story construction, but this site would actually benefit from a 12-story building. 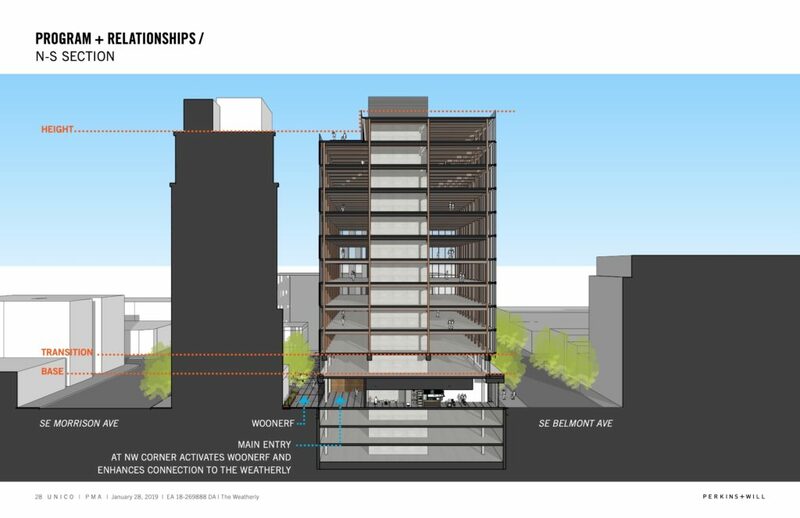 I think the proposal respects the Weatherly building in several important ways. 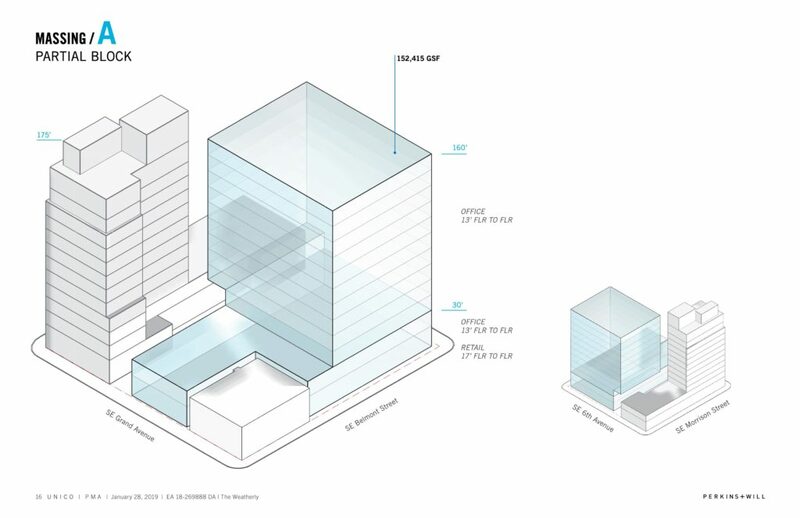 Its scale matches and does not overwhelm the Weatherly; the window patterning of its north section references the Weatherly; and the woonerf provides a respectful distance between the two buildings while activating the space between them. 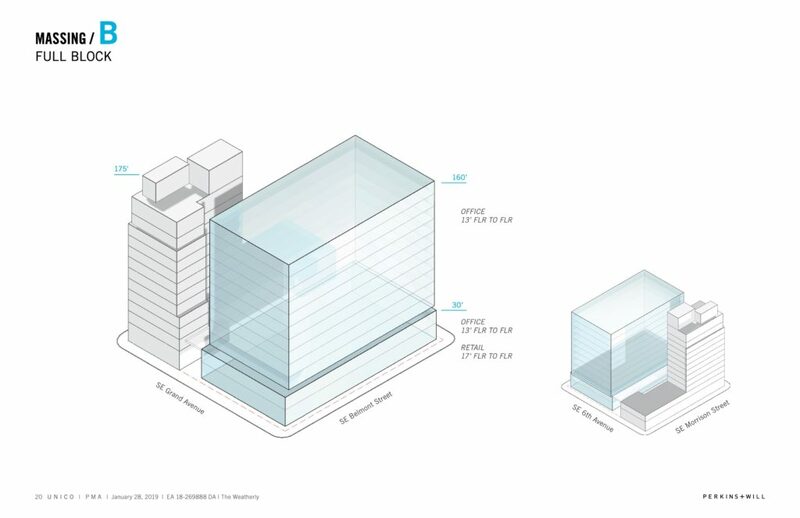 As well, I find the CLT bones + highly glazed skin that’s proposed to be a nearly perfect approach for Portland. 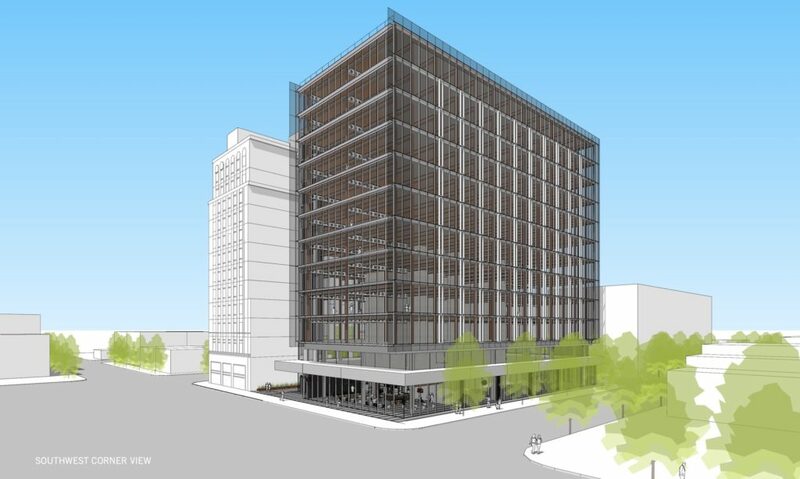 Cross laminated timber is a more environmentally responsible way to build than concrete or steel, supports an Oregon industry, and brings the warmth and joy of wood to the people using the building. The highly glazed surface allows more precious light inside and allows people on the outside to enjoy the activity that’s going on within the warm, wooden insides. And when lighted at night, these kind of buildings emit a soft amber glow. I appreciate the West facade and how it allows itself to mimic or speak with the existing building, then suddenly shifting into the more “contemporary” glazed box. It’s clear and concise, it’s not great, not bad either. Much better than just faking another brick building to “blend in”… those are the neo-historical? What do we call those? God forbid something interesting be allowed to be built next to that bland odd duck. It could use a striking companion. Interesting ??? 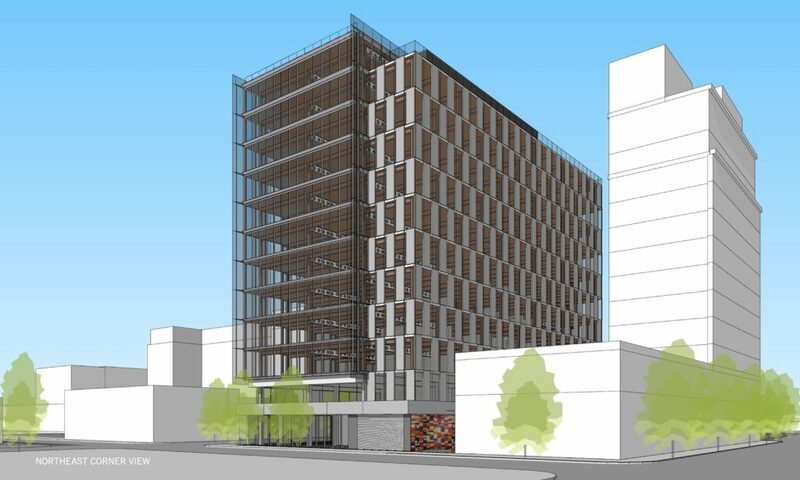 How many variations of a checkerboard grid facades can we put up on new buildings so they will all be so “trendy”?? 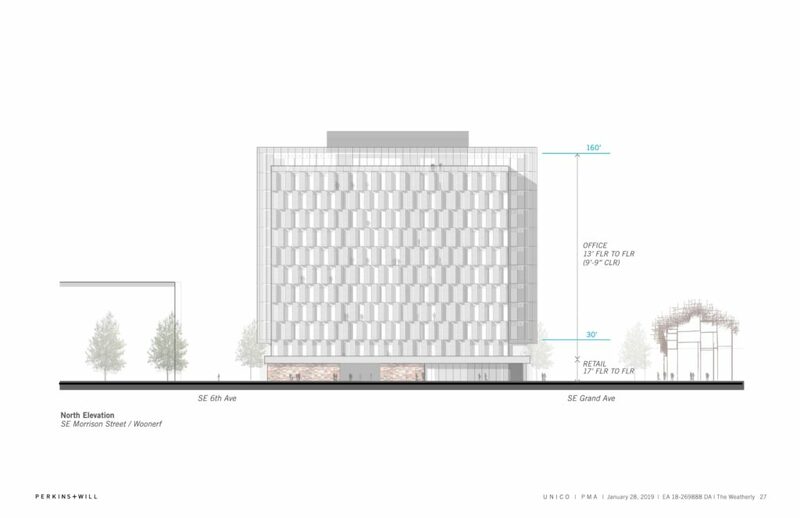 Until the next trend comes along….The design commission continues to approve buildings of “fashion” not substance. I guess they look at it all like Architecture Project Runway..one day you are in and the next day you are out. 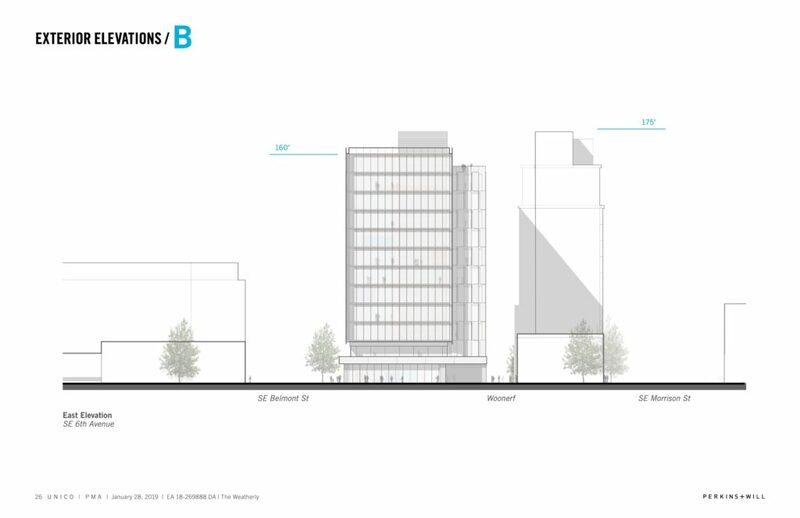 I find it curious that all the renderings are for scheme B, the plan which would necessitate acquisition of a property not currently under control of the developers, thus making it the less likely scheme to be built. The fact that the developers are pushing a proposal requiring property they don’t already own leads me to believe this building will never see the light of day. Even if they do acquire the Pour Sports Bar property, they’ll still have to run the gauntlet of historic review, due to its location in the East Portland Grand Avenue Historic District. 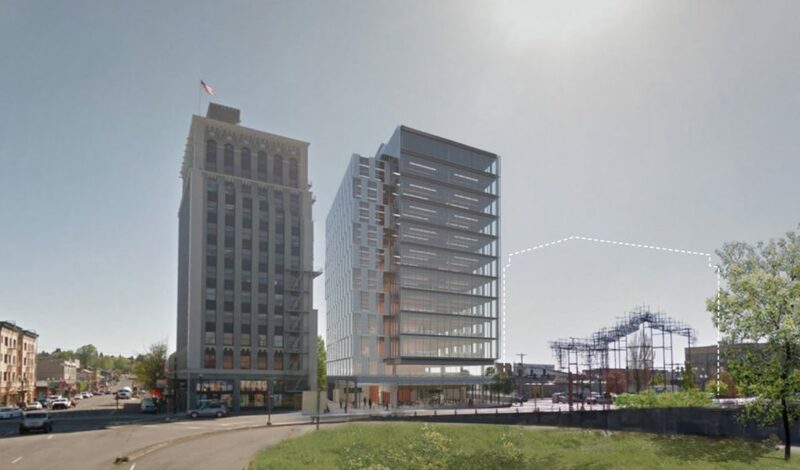 One only has to look at the changes that happened to the Grand/Belmont development, between first design review and final historic review, to realize that concern over any particular architectural element is deeply premature at this point. 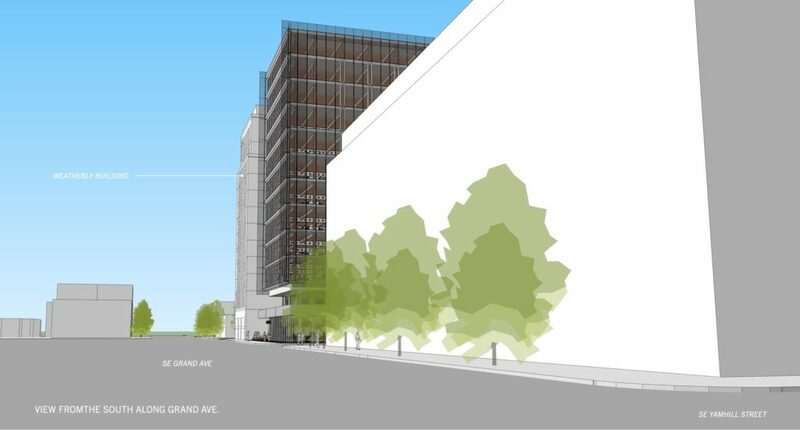 If this development moves forward at all, it will be unrecognizable by the time it achieves final approval. Building massing aside, my gut says that woonerf won’t be used often since it’s going to be a pretty dark wet place most months of the year stuck between two towers. To stir the pot, how about intentionally making it another Right to Dream spot instead of fighting against the future houseless tents in perpetuity? A heavily shaded loading zone sounds less like a people-first woonerf than a street under the CEID viaducts.